among local people about snow leopards. and in a family homestay. 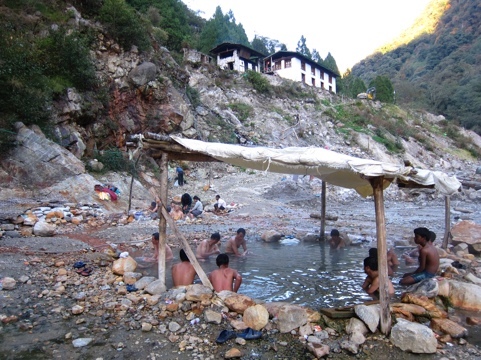 Soak in natural hot springs at Gasa. where ritual dances are said to negate your sins. KarmaQuest invites you on a trip to Bhutan to benefit snow leopard conservation, and perhaps catch a glimpse of other elusive Himalayan wildlife that contribute to Bhutan's standing as one of the world's biodiversity hotspots. KarmaQuest, in partnership with Snow Leopard Conservancy (SLC) and Bhutan Foundation, is helping to assure the continued well being of snow leopards in Bhutan by attaching a higher value to it being alive — bringing in wildlife spectators to view it — than dead. Your donation to SLC will support programs that encourage mountain communities to co-exist with snow leopards, turning herders who regularly lose livestock to snow leopard predators into wildlife guardians. On this Quest, we’ll visit the Black-necked crane conservation and ecotourism program in Phobjikha Valley and hear how it came to be from the Royal Society for the Protection of Nature (RSPN), our partner in conservation since 1992. We’ll stay in homestays with families who see the cranes as “tourism assets,” and will scout for takins, Bhutan's national animal (left) and the critically endangered White Bellied Heron, one of the 50 rarest birds on earth near Gasa. We’ll also tour some of Bhutan’s most treasured cultural sites, including the Punakha and Paro Dzongs, the infamous Chimi Lhakhang (home of the Divine Madman), and Thimphu’s excellent heritage, textile and arts and crafts museums. A highlight of the trip is the Thimphu Tshechu, an elaborate display of ritual dances performed by Buddhist monks in the national dzong. (photo left) Another high point is reached on a day hike to Taktshang Monastery (Tiger’s Nest) perched high on the cliffs above Paro (the hike is optional). 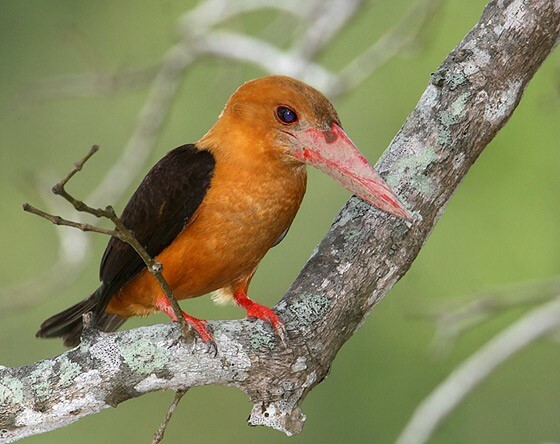 The trip includes other day hikes as part of wildlife viewing excursions but no overnight trekking. A soak in a traditional hot stone bath afterward will ease any sore muscles. If you prefer a chance see a snow leopard in the wild by hiking into their mountain habitat, and to celebrate traditional mountain culture at a village festival, please consider joining our Mountain Festival Trek for Snow Leopard Conservation. Day 1: Welcome to Paro and the Dragon Kingdom. After a warming cup of tea, visit the National Museum and Rinpung Dzong, a stately buiding combining Buddhist architecture and function with an historical government center. Enjoy a stroll over the covered bridge and along Paro's quaint downtown. Drive an hour to Thimphu, Bhutan's capital city and overnight. Days 2 & 3: Thimphu Tshechu and sights: Today is one of the most important days of the year in the lives of a Bhutanese Buddhist. The tshechu is a series of ritual dances performed by monks dressed in elaborate silk robes to a slow drum beat, sending blessings to all who attend. To lighten the mood, junior monks dressed as clowns romp and roll to the audience's delight. After a morning at the festival and the next day, we'll visit the Takin Reserve, for a guaranteed close up view of the national animal of Bhutan. We'll drive to a look-out point where a giant size Buddha statue overlooks the valley, stroll around the Memorial Chorten with local residents, and visit several of the impressive museums (Folk Heritage Museum, the Museum of Traditional Arts and Crafts, the Textile Museum), as well as the hand-made paper factory, time permitting. In the evening, we'll hear from Bhutanese conservationists about the country's approach to sustainable development. Welcome Dinner. Overnight in Thimphu. Days 4 & 5: Punakha: In the morning, we'll drive over 10,000’ Dochu-la (pass) adorned with prayer flags and offering panoramic Himalayan views when weather permits. Reaching Punakha, we'll then tour Punakha Dzong, built in the 17th century to house both secular and Buddhist leaders, ushering in the first unification of Bhutan as we know it. In the morning, we'll do some bird watching along the Mo Chhu (river) where one of the world’s 50 rarest birds, the White-bellied Heron is frequently sighted. We'll take a leisurely walk through golden rice fields (photo left) to Chimi Lhakhang, temple of the Divine Madman who is said to have cured infertility. Overnight two nights in Punakha. Day 6: Drive to Gasa: From Gasa, we'll venture on foot for a day of wildlife viewing. We'll be on the look out for takin, wild dog, and a variety of birds. Later, we can take a soak in a natural hot springs and will overnight in tents or a guesthouse near Gasa. Day 7: Phobjikha/Homestay: We'll drive over Pele La and descend to the high altitude marshlands of Phobjikha (10,000 ft), the wintering grounds for the endangered Black-necked crane. We'll arrive late in the afternoon when winter shadows exaggerate the hilly terrain. We'll check into our family homestay for two nights. Day 8: Phobjikha/Homestay: In the morning, as farmers are moving to their fields and children are walking to school, we'll drive a short distance to Gangtey Gompa (monastery). After visiting inside, we'll take a guided nature walk around the Phobjikha Wetlands, wintering grounds for the endangered Black-necked crane. Whereas the cranes usually arrive later in the season -- having flown over the Himalaya from Tibet -- we may be lucky and see a few. We'll visit the Royal Society for Protection of Nature (RSPN) Crane Conservation Center and learn from local conservation and village leaders how ecotourism provides incentives and builds pride in Black-necked crane conservation. Return to your family homestay for overnight. Day 9: Drive to Paro: Leaving Phobjikha, we'll drive again over Pele La, through pastoral scenes and thick rhododendron, magnolia and fir forests, again crossing Dochu La where we'll stop at a botanic garden. We'll continue past Thimphu to Paro. There are chances for excellent bird watching along the way. Overnight in Paro. Day 10: Chelela/Bird Watching: In the early morning we'll drive up the Chelela (pass) (12,700 feet), stopping en route to scout for birds. With a wide ranging elevation profile of 8,000 to over 12,000' there is an equally diverse population of birds to be seen, including the Kalij, Blood and Monal pheasants, collared and white-winged grosbeaks, spotted and black-faced laughing thrushes, snow pigeon, white-winged rose finch and more. If we are lucky, we'll also have excellent views of Mt. Jhomolhari from the top of Chelela. Return to Paro and overnight. Day 11: Paro/Taktshang Monastery: Last but not least is a day hike to Bhutan’s most sacred site (photo left), known as Tiger's Nest, a cliffside spot where Guru Rinpoche landed on the back of a flying tigress long ago. Cave-like rooms house Buddhist images and statues imbued with centuries of prayers of Himalayan visitors. At the endof the day is your chance to take a traditional hot stone bath, heated with fire-heated river stones in a wooden tub. A once in a lifetime experience! Overnight in Paro. Day 12: Depart Paro: Depart Paro and connect to your international flight homeward. Or inquire about a short extension holiday in Bangkok, Delhi or anywhere in the region. A requested tax-deductible donation of $500 to the Snow Leopard Conservancy helps support snow leopard conservation, research, and ecotourism development programs.